Back cover: "Iain Pears tells the story of John Stone, financier and arms dealer, a man so wealthy that he was able to manipulate markets, industries, and indeed entire countries and continents. A panoramic novel with a riveting mystery at its heart, Stone's Fall is a quest to discover how and why John Stone dies, falling out of a window at his London home. Chronologically it moves backward--from London in 1909, to Paris in 1890, and finally to Venice in 1867--and the quest to uncover the truth plays out against the backdrop of the evolution of high-stakes international finance, Europe's first great age of espionage, and the start of the twentieth century's arms race." I recently discovered Iain Pears Art History mysteries, so when the opportunity to get an advance reader copy of "Stone's Fall" came up through Shelf Awareness, I didn't hesitate to request it. It is told through the view points of three men, in three different time periods and revolves around John Stone, his widow, Elizabeth Ravenscliff, and a mysterious child mentioned in Stone's Will. "Stone's Fall" is told in the first person point of view of each man. Normally, first person point of view isn't my cup of tea, unless it is very well done. The impact of the tale would have been totally lost using third person point of view and the writing is excellent. Kept my attention throughout the story, which is 800 pages long. It is detailed without being boring. The characters are well written and very three dimensional and pull you into the story all the way from London to Paris to the canals of Venice. One particular passage stood out to me when the journalist, Matthew struggled to understand finance. He recruited a friend, a banker who lived for numbers to help his decipher Stone's papers. "He believed that the rich were better people than the poor, and that to be around them made him better as well. Wealth was both the indication of God's favour, and provided the means to carry out His wishes on earth. "Harry Franklin, you will understand, had no trouble whatsoever in reconciling God, Darwin, and Mammon; indeed, each depended on the others. The survival of the fittest meant the triumph of the richest, which was part of His plan for mankind. Accumulation was divinely ordained, both a mark of God's favour and a way of earning more benevolence. True, Christ was a carpenter, but, had He been living in the twentieth century, Franklin was sure that the Messiah would have paid good attention to His stock levels, steadily expanded His business into the manufacture of fine furniture, while also investing in the latest methods of mass production by means of a stock market flotation to raise the additional capital. Then He would have brought in a manager to free Himself to go about His ministry." "Stone's Fall is full of intrigue, secrets, behind closed door plotting, murder, manipulation, and deceit. It isn't one of those stories you can read quickly or skim or you will miss a lot of detail. Highly recommended. Other thoughts about "Stone's Fall"
"Not to put too fine a point on it, this is a masterwork by one of the most ingenious and versatile writers of our time." 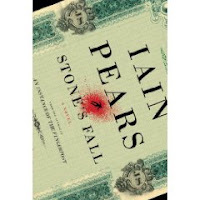 "In today’s world where high finance and the industrialization of capitalism are crumbling all around us, Iain Pears’s novel, Stone’s Fall, is a revelation with chilling implications. More so, it is an engrossing and mind-bending story that moves backward and forward through time with ease and familiarity. " "From the first page of Stone's Fall, the reader is immersed in a remarkably well-plotted story, rich in detail, elegantly told."